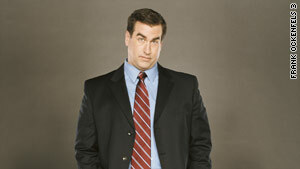 Comedian Rob Riggle takes a light approach to some holiday trouble spots. Comedian/actor Rob Riggle is a former correspondent with "The Daily Show"
Former "Saturday Night Live" cast member appears in CBS's "Gary Unmarried"
(CNN) -- Holiday gatherings can be rough. You have a sneaking suspicion Uncle Joe is going to have a drink or five too many, and you're still wincing about that great gift your brother's girlfriend gave you last year, when you didn't get her a thing. You probably know how to handle these situations with grace and poise. But how would you really like to do it? Comedian Rob Riggle is here to provide a little inspiration. We asked Riggle -- a former "Daily Show" correspondent who also appears in CBS's "Gary Unmarried" and films including "The Hangover" -- to suggest some mischief for those awkward holiday moments. And for those without the comedic chops to follow his lead, we've also sought expert advice from stress management consultant Kathleen Hall, founder and CEO of The Stress Institute, and Stephanie Smith, a licensed psychologist in the Denver, Colorado, area and contributor to the American Psychological Association blog "Your Mind Your Body." Riggle's take: Thank goodness for current events. "And that's it, you're off the hook. And you're one up on presents." Expert advice: Smile graciously, say thank you, don't feel guilty, and don't decide on the spot that you're going to give something in return, Smith and Hall say. Gift-giving doesn't always need to be reciprocal. "[Being thankful] is more important than stammering, 'I forgot your gift and I'll bring it tomorrow,' " Smith says. Riggle's take: Is the spotlight on you after Uncle Jim asked about your unemployment? Use it. "If you can deliver it with a straight face, tell them you're thinking about becoming a rapper," Riggle says. "That will get them off your back. "Give them a little demo of the rapping skills. That's always nice, have a little rap in your pocket. Give them a taste. But you have to commit to it, like, 'My name is Rob, and I like corn on the cob' -- something that's awful, but make them believe you're sincere about it. "That usually will work on at least getting them to talk to each other instead of you." And if you're interrogated about your nonexistent dating life? "I think being a little obnoxious at the top would signal you're not appreciating the conversation," Riggle says. "If they ask when you are getting married, say, 'Tomorrow.' That's letting them know, 'OK, he's not going to answer me seriously,' and they'll be off your back." Expert advice: Come up with canned responses now -- ones that answer the question sufficiently but put a period on the topic. "That leads to the next topic. You can say, 'Speaking of 2010, what are you doing for New Year's?' "
Riggle's take: "You have to sell how happy you are," he says. "This is where it falls on you to be your absolute best. You really have to sell your joy and love for the world. You're leading the carols. Then they'll have to say, 'Wow, you're really happy. Your joy cannot be denied.' "
And what will the new date think? "The new partner will love it," Riggle says. "She won't know why you're happy. She'll think, 'Hey, this guy loves family. Maybe I'll want to marry him.' It just works all the way around." Expert advice: The best defense is a great offense. Walk straight up to people and confidently introduce him or her. "That can take people who thought they had the upper hand off guard, because you're showing confidence," says Hall, the Stress Institute founder. In case someone gives you a weird look, have an escape plan. "Say [to your date], 'You wanted a drink, right? Let's get one.' Or, 'Look over there, there's Fred. I wanted you to meet him, too,' " Hall says. Riggle's take: Now might be the time to put the fun in dysfunction. "Generally speaking, when people drink, it's bad-decision time. That can be a lot of fun," Riggle says. "That's an opportunity to talk them into doing something stupid, like getting them to take off their shirt or wrestle in the living room." "Also, alcohol serves as a truth serum, so that's the time to ask those tough questions. Get that family gossip out there, like the time cousin Eddie pooped his pants or something along those lines. "These opportunities only come around so often -- weddings and holidays, that's it. Milk them for all you can get. That's the time to get the family dish." Expert advice: Hall and Smith say it's generally best not to engage the heavy drinker, lest you risk an ugly scene. Hall, though, adds that someone with a good relationship with the person may want to kindly ask him or her to tone it down. "Don't shame them in front of others -- take them into the next room and talk to them," Hall says. Smith says visitors can prepare an exit strategy: "Talk with your partner or kids and say, 'If Aunt Suzie starts screaming, that's our cue to go home.' "